(Francisco Kjolseth | The Salt Lake Tribune) Real Salt Lake midfielder Damir Kreilach (6) gets the ball over Los Angeles Galaxy goalkeeper David Bingham (1) before heading it in for his first goal during the first half of the MLS soccer match Saturday, Sept. 1, 2018, in Sandy at Rio Tinto Stadium. 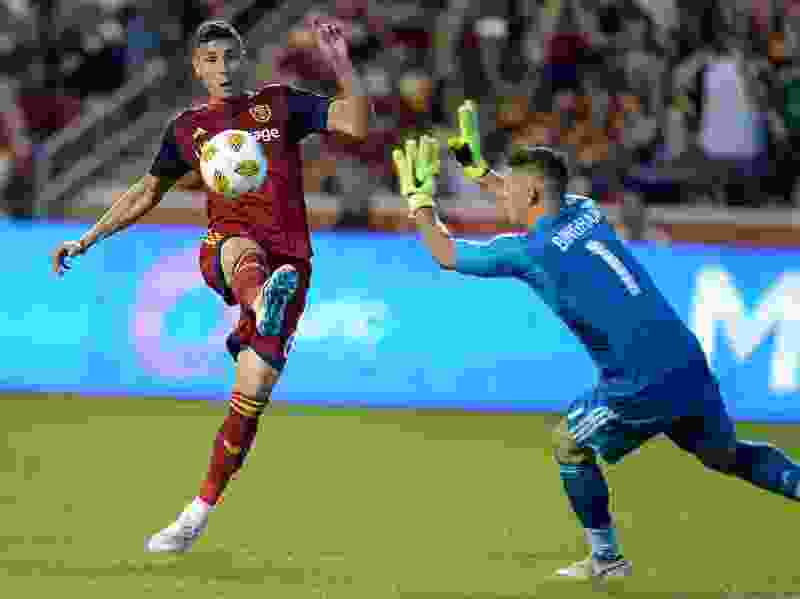 Sandy • Real Salt Lake midfielder Damir Kreilach did not shy away from the importance of the team’s game Thursday against the New England Revolution. With just two games left in the regular season, RSL is still in the sixth and final playoff spot in the Western Conference. The L.A. Galaxy are only two points behind RSL in the West standings. The Revolution, on the other hand, were eliminated from the playoffs over the weekend. Forward Corey Baird said the team tries to stay away from all-or-nothing scenarios, but he echoed Kreilach’s comments. While no one’s lives are literally at stake against New England, RSL’s playoff lives might be. After not coming away with wins in its last two home games, the team has left points on the table. But RSL coach Mike Petke is focusing on the quality of his team’s play and not on a specific result. By the time RSL plays New England on Thursday, the team will have had 12 days between games. Some players said the layoff was good for the team as a whole. Throughout the season, RSL has had four instances in which the Major League Soccer schedule created gaps of at least 10 days in between games. RSL is 1-1-2 in games played in those situations. The long layoff gave the team an opportunity to start preparing earlier than normal for playing the Revolution, which RSL has not faced yet this season. Petke said the team has been figuring out its approach for the game since last week.